Historically, European churches have played a large part in the provision of welfare. Responsibility, however, has gradually shifted to the state - a shift that forms an integral part of the process of secularization and one that has been readily accepted by European populations. But what happens when the state itself begins to recede - a process that is occurring in most, if not all, European societies for a wide variety of reasons? The implications for welfare are considerable, not least for the role of the churches which begin to resume the responsibilities previously shed but in new and different ways. This book looks at the connections between religion and welfare in Europe, exploring in detail eight European societies - Finland, Norway, Sweden, England, Germany, France, Italy and Greece. The different theological traditions, different church-state relationships and different welfare regimes are all examined. The analysis is based on first hand empirical research which considers not only the changing situation on the ground, but attitudes towards this within a range of different constituencies - the churches, local government and the general public. Particular attention is paid to the significance of gender in both the process of change and in attitudes towards this. Welfare and Religion in 21st Century Europe: Volume 1 represents comparative research at its best and highlights key policy implications for the future. 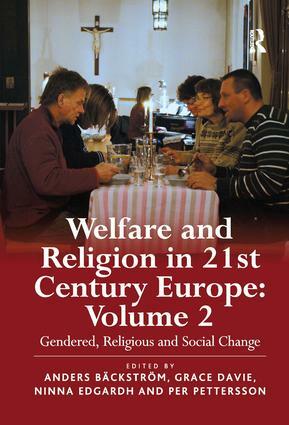 A companion book, Welfare and Religion in 21st Century Europe: Volume 2 explores thematically the changing nature of religion and welfare and the new relationships that are emerging between the religious and the secular, and between church and state in the 21st century. Anders BÃ¤ckstrÃ¶m is Professor of the Sociology of Religion, Uppsala University, Sweden; Grace Davie is Professor Emerita of Sociology, University of Exeter, UK; Ninna Edgardh is Associate Professor of Ecclesiology, Uppsala University, Sweden; Per Pettersson is Associate Professor of the Sociology of Religion, Uppsala and Karlstad Universities, Sweden. All four authors have worked together on a number of projects. These include: From State Church to Free Folk Church (a study of the constitutional changes in the Church of Sweden), Welfare and Religion in a European Perspective (the basis of this book) and Welfare and Values in Europe (an EU funded project). They are currently engaged in a new Linneaus Research Programme, entitled The Impact of Religion: Challenges for Society, Law and Democracy. This is based at Uppsala University and is funded by the Swedish Research Council.